Fez (فاس) (French: "Fès") is one of the imperial cities of Morocco. It is famous for being home to the world's oldest university, the Qarawiyyin university (established in 859 but became a university in 1963). It has an ancient walled city, which many compare to the walled city of Jerusalem. Fez is the medieval capital of Morocco founded by Idris I in 789, and a great city of high Islamic civilization. Fez has the best-preserved old city in the Arab world, the sprawling, labyrinthine medina of Fes el-Bali, which is incidentally also the world's largest car-free urban zone. Within the medina transports of goods is provided by donkeys, mules and handcarts. Since the availability of low-cost flights to Morocco, Fez has become a very popular destination and English is widely understood. Fez has a mediterranean climate with strong continental characteristics and a lot of rainfall, averaging around 700 milimeters (27.3 inches). Fez experiences the coldest winters of any major city in Morocco with the average low in January being 4°C (40°F) and the average high being 15°C (60°F). Frost isn't uncommon from mid-December to late-February and Fez is the only major city in Morocco that records snow every year with an average of 0.2 days with frozen precipitation. Major snowfalls however occur once every 4-5 years. The record low is -8°C (17°F). Summers are hot with temperatures usually ranging from around 34-35°C (93-95°F) to just below 20°C (68°F). When the city is hit by heat waves the mercury can skyrocket above 40°C (104°F). The record high is 46.7°C (116.1°F). Royal Air Maroc offers daily flights from Casablanca London-Gatwick and Paris-Orly to Fes-Saiss Airport. Jetairfly offers flight from Brussels Charleroi Airport. Ryanair offers flights from Barcelona (El Prat), Brussels (Charleroi), Dusseldorf (Weeze), Eindhoven, Frankfurt (Hahn), Lille, London (Stansted), Marseille, Memmingen, Milan (Bergamo), Nantes, Nimes, Paris (Beauvais), Pisa, Rome (Ciampino), St.Etienne and Toulouse to Fez, though not on a daily basis. The airport is located about 15 km from the city. One option, if you don't have too much luggage, is to take a 'local bus' (line 16) costs 4 Dirham, or you can choose a 'taxi' (cost 120-150 dirham into town, price is for the whole car). To the airport, the Bus 16 leaves from the stop near the train station every hour. It takes about 40 minutes to get to the airport. Facing the train station the bus stop is on the left of the entrance near a parking lot for taxis. The official stop is just behind the round-about, seen from the train station, after the petrol station, at Rue Lalla Asmaa, it is has a sign and bus 16 starts around :45 every hour, cost 4 Dirham (June 2017). The bus to the airport seems to be 10 dirhams, with times at 3pm, 5pm, and at least another after. It waits right in front of the Total gas station which is directly south of Gare de Fes train station. There is a bus stop sign with route 13 on it, but 16b definitely begins here. The grand taxi station is directly to the southwest of the train station, with petit taxis all in front as well. There is a fixed price for a taxi MAD 120 (MAD 150 -April 2016) from the airport to the town centre. If you come in the night it's a good idea to book it in advance. It is MAD 120 to the New Town, and 150 to the medina. The train station Fès-Ville. edit is found at the northern end if the Ville-Nouvelle. There is regular train service along the Marrakech to Oujda and Tangier to Oujda train lines. The trip from Casablanca takes about 3 hours 20 to 4 hours 20 and costs 165/110 Dirhams. (1st class/2nd class). High speed double decker trains are being phased in on this route in 2011. There are five trains per day from Tangier arriving after 4.5 hours at a cost of 155/105 dirhams (1st class/2nd class). From Rabat takes about two and a half to three hours, and costs 75-105 dirhams. In summer, train compartments can be hot, with passengers standing everywhere when all seats are taken. While occasionally unreliable, first class compartments are generally well air-conditioned, with assigned and numbered seats. Be aware that there are hustlers operating on trains into Fez. See the Stay Safe and Cope sections, below. A petit taxi between the train station and Bab Boujeloud costs about MAD10 with taxi meter. Insist on using the meter, if necessary, say "khdm l-koontoor" (Work the counter) to the taxi driver. Fez is about 3 hours' drive by car from Casablanca. The stretch of toll highway from Rabat to Fez is in superb condition. 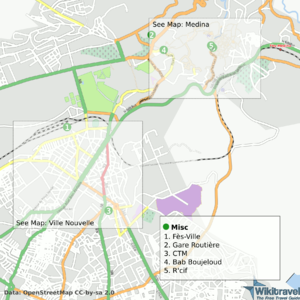 The motorway continues from Fes to Oujda in the far east of Morocco. Travelling by grand taxi (inter-city taxi), is viable for tourists. Places in the taxi (usually an old Mercedes car) are sold individually, however they carry 6 passengers, 4 in the rear and 2 in the front, in order to travel in relative comfort, you may wish to purchase more than one seat. A ride from Fez to Casablanca costs approximately 160-180 dirhams per seat. Note that grand taxi fares are regulated and it is worth checking the official rates with the tourist board, as some drivers or hotels will quote inflated prices. Within Fez, ride in the petits taxis (local taxis) rarely cost more that 15-20 dirhams. However, the medina of Fes el-Bali is only accessible from a few points by car. Bab Boujeloud, nearby Place Batha, and Place R'cif are popular dropoff points, for parking there is spaces at Ain Zleten on the northeast edge of the medina. Another openair parking is situated near Hotel Batha (price 20 Dhs / day). If you stay longer than 1 day don't pay in advance. Taxis in Morocco are much cheaper than in Europe and if you're looking for a less stressful way of getting from A to B than the Grand Taxis, hiring a private taxi for the day can be a good option. Private companies will normally have English-speaking drivers, and will also usually have air-conditioned vehicles, but make sure you check first because in the summer it is quite necessary! TravelFes: 3 Rue El Douh, Fes, Morocco. Affordable private transfers and day excursions with modern vehicles and bilingual drivers. The old bus terminal (Gare Routière. edit) is just outside Bab Mahrouk on the the north side of the old city, near the Ain Zleten entrance to the medina and Bab Boujloud place. Grands taxis (inter-city taxis) can also be obtained here. The CTM terminal (gare CTM. 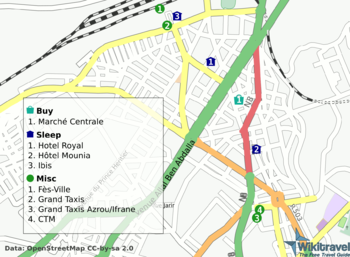 edit) is in place Allal el-Fassi in the Atlas neighborhood of the ville nouvelle, and has taxi stands nearby. While the gare routière covers more routes more cheaply, many travelers prefer CTM for its reliability and cleanliness. Most CTM buses leaving Fes, anyway, start from the gare routière and make a stop in the gare CTM after 30min in the town traffic. CTM bus coming into Fes, at the contrary, will leave you at the gare CTM. Buses number 19 and 29 will transport you between Placa RCIF and the McDonalds/Careffour/Barcelo hotel. Prepare 3.50 MAD for the journey Just say: MaRhum + 'the place you want to go to'. If it is a wrong bus, you will be told where to go, or at least gestured. Don't forget about min fadlak (please). People don't expect it, it seems, but they look like they appreciate it a lot. 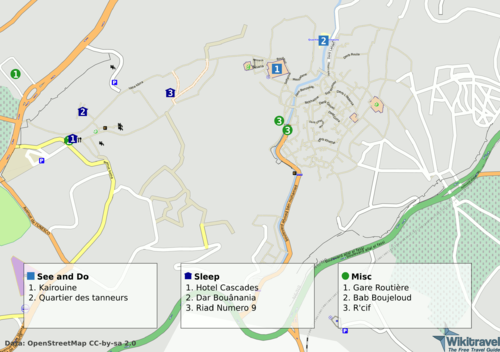 Map displaying the medina walking routes. Ignore the travel guides that tell you that you'll get lost in the medina and that you must hire a guide. One of the easiest ways to get around is to use the red taxis to take you to the nearest gate (bab) and then walk from there until you get your bearings. Gates are all around the city and taxis are cheap. A rough map of where the sights are will help too. If you are particularly worried, be sure to arrange a licensed guide through your hotel or the tourism office - they will be able to give you an accurate history and will make fewer shopping stops. The faux-guides in particular will simply take you from shop to shop where you will be pressured to buy goods, which will cost you extra because the seller will be obliged to pay the guide a hidden commission; they seems to wait near bab boujloud for tourists arriving in the late afternoon, simply don't reply them, first they understand where you are from and then start follow you explaining incomplete infos, finally they'll force you to pay by paper. There are some basic landmarks that you can use to get around, and there is a path network marked by signs perched on walls, although these can be hard to locate at times. These signs have a 8-point star shape which will guide you between the main places in the medina. If you are lost you only have to find one of these signs and follow it in any direction until you arrive to a map or a known place. You may also find it useful to carry a compass, as the narrow, built-up streets can block the view of landmarks and be disorienting. Alternatively, just keep heading downhill and you will eventually get to a gate. The main street is the Talaa Kbira, which runs from Bab Boujloud باب بوجلود. edit to the Kairouine mosque مسجد القرويين. edit in the heart of the medina. The Talaa Sghira also begins at Bab Boujeloud and eventually merges back into the Talaa Kbira. Once you get into the narrow, windy heart of the medina, you can also find your way out again by constantly heading downhill, which will eventually lead to the Place R'cif. edit, a dropoff for buses and taxis, where you can get a petit taxi out of the medina. For more detailed tours and directions, look for the book Fez from Bab to Bab (Hammad Berrada). It has a complete map of the medina and several well-described walking tours. It can be found in most bookshops, both on the Talaa Sghira or at the large bookstore on the Avenue Hassan II in the ville nouvelle. However, be discreet taking out your map or you will have many offers from false guides! Bab Boujloud, the upper and main entrance to the medina. Just walking around, you will see a great deal! Get a shave in the medina, nowhere is it cheaper than here, and they really pay attention, even trimming your hair. In the midst of the maze-like medina are the colorful leather-dying pits. Any number of young boys will offer to guide you to them: just listen for "you want to see the tanneries?" The tour is free (though it is appropriate to offer 1-5 dirhams to your "guide"). There is no chance of getting to see the tanneries by yourself, instead, be prepared for physical abuse for even trying! However, just 10m left of the entrance is a leather shop that offers views to the tannery free of charge and you can see it all from the balcony. Expect to be pressured into buying goods from the shop in return. It is possible to get into the tannery itself, hang around near the entrance until someone offers to take you in for 10 dirham. He will get you past the entrance and then you can wander in amongst the workers. A word of advice...wear closed shoes and maybe bring a mint leaf to sniff if you have a weak stomach. Bou Inania madersa المدرسة البوعنانية: a breathtaking 14th-century religious college. The best example of Islamic architecture a non-Muslim can see in Fez, with wooden walls elaborately carved with geometric patterns and Arabic calligraphy, and a beautiful minaret. 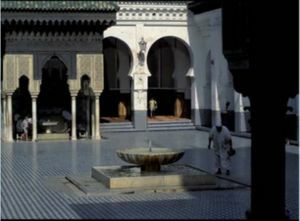 In the courtyard there is a portico with a still-functioning mosque, separated by the rest of the courtyard by a small moat. The view from the hills surrounding the old city is spectacular- there are two fortresses overlooking the old city, the Borj Nord which contains an armaments museum, and the Borj Sud, which is being developed for tourism. The Merenid Tombs next to the Merenid Hotel, provide excellent panoramic views over the medina and the wider city, as well as the olive tree lined hills surrounding the city, and sanctuary from the bustle of the rest of the city. Beware of the odd opportunistic tout. The Sofitel Palais Jamai terrace has an incredible view over the medina if you are willing to pay 30 dirhams for a glass of tea in order to access it. This is particularly worthwhile if you can time your visit to coincide with the call to prayer, as you can hear multiple minarets from the terrace. Entrance to the Moulay Idriss II shrine, the tomb of Fez's founder, is limited to Muslims, but the view from just outside its doors is still well-worth hunting down. The mosque is just off the Talaa Kbira near the Souk Attarine. Similarly, the Qaraouyine library and mosque and the al-Tijani mosque have beautifully decorated exteriors and worth a visit even by those who cannot enter them, which includes all foreigners considered to be non-Muslim. One of the most fascinating activities to do in Fez is a trip in the medina (Old City). The medina is so complex to navigate that sometimes it's easier to simply lose yourself in the hustle and bustle of the various markets, and find your way out once you have had enough of all the sights, sounds, and smells that will overwhelm your senses. You will eventually find your way out via lots of dried fruit, leather goods, ceramics, textiles and food stalls! Make sure you find an opportunity to escape from the bustle of the streets and see the medina from one of its rooftops - some shops and restaurants have rooftop terraces (see the food section below for some useful tips). The views are particularly spectacular during sunset and after dark. There are several well-marked trails through the city: follow the green (Andalusian palaces and gardens), orange (walls and fortifications), or blue signs and you won't get lost in all the narrow twisting streets. In Fez, there is one neighborhood called Sidi Ibrahim حي سيدي إبراهيم , which is most famous for textiles and tailoring firms. Tagines for sale in Fez. Some may consider Fez to be the handicraft capital of Morocco, but in reality the quality and value of its wares can be hit and miss. Leathergoods, copper and brassware are the bargains to be had, although you may also find good prices on drums and other musical instruments. Tagine dish (see picture): 10 Dh - 20 Dh for a full size tagine dish, plus an extra Dh 10 if it's been varnished and / or decorated. If you're interested in the cobalt-blue ceramic, you might go to the potteries where they make it. It's really cool to see how they model the clay into a tagine in 45 seconds. From Bab el-Ftouh, it's a 5 dirham taxi. Ask the driver to take you to "Les potteries de Fez". There're 2 big "factories", both show you the whole process if you want or you could just see the exhibition (and buy). Bargain really hard, prices seem to be fixed, but they are not at all! The markets near the 'main' gate of Bab Boujeloud (near to Hotel Cascades) are full of yummy food. It is worth just wandering through them, buying random bits of food. Street food is very cheap and is often safe. Restaurants, even cheap ones, will often be up to twice the cost of street food, and the quality can be the same. In the medina is difficult to find cheap food other than in the Bab Boujeloud area. There are only a very few tourist restaurants where you will get ripped off and some food stalls down in the food market near the R'cif place. Casa Nostra - For pizza, you can try this Italian restaurant, 1 block from Hasan II and Mohammed V.
Le Palais de Fes - Also known as Dar Tazi (Place R'cif). A rooftop restaurant over a carpet shop, Dar Tazi offers Fez's best pastilla and other traditional dishes. The stairs up are steep and narrow and dinner runs about 350dh per person, but the food and view are well worth it. Palais des Merinides (Talaa Kbira). Table d'hote menus with basic Moroccan specialties in a very grand setting. Mediocre quality, but fabulous surroundings. San Remo Fed up with couscous and tajine? Then you could try this Morocco owned Italian restaurant in the new part of town. Just opposite the police station, it offers a lovely Italian deli and numerous pasta and pizza dishes for a decent price. Dar Saada Restaurant  Located in the centre of the medina, this restaurant is a favorite of Travel and Leisure magazine and is worth the indulgence. L'Ambre: [www.restaurantfes.com], Located in the heart of the medina, it offers an elegant and superior dining experience in all of Morocco. Serving up Moroccan cuisine with innovative twists, food is served in one of three rooms, including a spectacular terrace. Almost all drinking establishments in Fez are hotel bars. The rest are local bars that women and anyone without a good command of Arabic might be uncomfortable entering. In bars of either type, prostitutes are frequent but mostly ignore western travellers. Fes is a much more traditional town than Casablanca or Marrakesh, and it is technically illegal to drink in public. Purchasing alcohol or seeming intoxicated are sure to draw stern looks from passersby. The Bar at Hotel Batha Place Batha. In the rear of Hotel Batha are two bars - the first is more of a lounge, with comfortbale leather chairs and fireplaces. It is definitely the more stately of the two options. In the rear is a night-club type bar that is mostly empty and rarely open. Restaurant International, The Car Park at Av. Abdellah Chefchawni. This little place is easy to overlook, but the fact that the outer windows are mirrored should be the first indication it won't be at the top of any tourist routes. The crowd here is all local, and foreigners might expect a few stares and side looks. They serve the basic selection of beer, as well as some of the best spaghetti and pizza in town. Three stories, but avoid the middle one - the band is usually blasting bad synthesizer-Arabic music. Also avoid the basement, unless you're looking for prostitutes. Most visitors to Fez will want to stay in the medina as the main tourist sights are located there, and the new town is quite a distance from the medina so you will be relying on taxis to take you in and out every day. RIAD VERUS Derb Arset Bennis, Batha - safe choice. Excellent wifi. Favourite for Semester at Sea students. Cheap deals to be had. Lush views. Spacious dorms and good vibes too. Worth checking out. 0535741941 or whatsapp on 0034651666575. [email protected] - Deals from 100 dhm a night in ensuite dorm rooms with ac and breakfast included. Dar Adam 41, Oued Souafine Fez medina (in front of riad Al Kantara), tel: 0535 63 5997/whatsapp: 0031633 767 765 / email: [email protected]. Free wifi, stunning roof terrace, quiet, clean, very friendly staff and very well placed in the medina. Organises hammam visits, medina visits with a professional guide and city (and/or regions) tours. Twins, triples and double rooms with shared bathroom. Rooms are all private, no dorms. Price: from 20 euro per room. Riad Doha 21, derb Sefli, Rass Jnan, Bab Jdid, tel: +212661834912, quite close (5 minutes walk) to R'cif square and 10-15 minutes walk from Bab Boujloud. The riad has WiFi, enough warm water, breakfast is included in the price you pay (plenty and delicious) and you have a terrace on the roof (as most riads) with a good view of the medina. Tea is free when you wish and the staff are really, really friendly and helpful. It is recommended to speak with them about any doubts you have about Fes and your stay in general. They can also arrange a tour guide or just a shopping guide (but still be aware of what he recommends) for 50+Dh, depending on the amount of things you want to see. You can also ask the guys (Mohamed and Said) to help prepare a traditional Moroccon dish one of the nights. Prices, per night, for a room are 20-30Eur. Camping Diamant Vert,Rue Ain Chkef. Decent amount of shade, french toilets and (sometimes warm) showers. 25 Dh a person, 15 Dh per tent. Free access to the swimming pool. HI youth Hostel (Albergue Juvenil), 18 Rue Abdeslam Serghini, tel 035.624085. Clean, bright, friendly and well placed in the ville nouvelle. A dorm bed costs 75 Dirham (including breakfast?). There also are double rooms with shared bath. Hotel Erraha (near Bab Boud Jeloud - main gate) in the Medina. Ugly and noisy, not absolutely clean but could serve for a night if you don't find another place, 100 Dhs. One of the employees, Mohammad, is a good man, and will gladly tell you about the history of Fes, and help you out if you need anything. There are a few more hostels near the main gate walking down any of the two parallel main streets, but not many of them. Try to arrive well before dark. The streets beyond the two main ones can be frightening at night. Pension Batha, (100-250 Dhs) 8 Sidi Lkhayat Batha, Fax: 05-574-1150, just across from Hotel Batha, around the corner from Bab Boud Ganoush. It has limited rooms, and fills up quickly, but they are clean and include private bathroom. It comes with breakfast on a nice (but small) terrace on the top floor. Double Room with bathroom 250 Dhs. Breakfast very simple but OK. Ask for Laila (English spoken). Hotel Volubilis, 42 Abdellah Chefchaouni, tel 035.620463, 80 Dh for a double, 120 Dh for apartments for 3-4 people. Bed bathrooms (cold shower, just over the toilet). Dar El Menia Boutique Hotel: lies in the heart of the Fez (Fes) Medina. This 17th Century Dar or courtyard house has sympathetically been restored using traditional local craftsmen, techniques and materials and provides the perfect luxurious base to explore the Medina of Fez. Situated adjacent to Talaa Kebira, the Medina's main street. it offers easy access to all major sites of interest. Dar El Menia offers you an authentic Moroccan experience in all aspects of your stay and represents great value for money. Double and family rooms from only 60 Euros, including breakfast and all taxes- there are no hidden charges. Concierge service offering cookery workshops, airport transfers, guided tours of the Medina etc. Friendly and helpful team. Dar Aquas: Dar Aquas is a beautifully restored, 5 bedroom boutique riad guesthouse in the in the oldest part of the ancient medina of Fez. The 300 year old restored Dar, as the traditional courtyard houses are known, features intricate original hand carved plaster decoration, 4 metre high carved cedar doors, hand cut tilework, and cedar beamed ceilings. It is 5 minutes from the Rcif Gate, close to taxis and public transport. Dar Aquas is near many of the historical sites of Fez including the Kairouine and Andalous Mosques, the Attarine Souk (market), several old medersas (Koranic schools) and the famous Fez Tanneries, all of which are within close walking distance. Double Rooms from about €75 Euros incl a complimentary breakfast & free WiFi. They sometimes have special offers during the Low season. Dar Anebar: Beautiful riad decorated in a traditional Moroccan style, but including a host of modern amenities. This place is really the best of both worlds: if you stay in the Dar Anebar Annex, you can enjoy the elegance of a riad, while still having access to the convenience of free wifi, hot showers, and french toilets. Also great location, just minutes from Bab Guissa. During the off-season, double rooms in the annex are only 65euros per night. Dar Bennis: traditional 18th century house (riad) in the Medina for vacation or holiday rental for up to five people, starting at 80 euros for entire house. This website  also has lots of information about Fez museums, architecture, restaurants, real estate & monuments. Dar Mystere: traditional Fassi house (dar) in an excellent location in the Medina for vacation or holiday rental for up to six people, starting at 50 euros for exclusive use of the house. This website  has more information. ChezMaMounia - Bed And Breakfast, (34-55 USD)  Avenue Saint Louis, Tel: 06-99008110, Behind Hotel Jnan Fes Palace. For those who want to discover or rediscover the magic city of Fez with an authentic Moroccan family. Lounge House: A traditional Masriya (house for the elder son of the family, profusely decorated) with a contemporary twist. Its up for vacation or holiday rental for up to four people, starting at 90 euros night for the entire house. Interesting links in the website containing much needed info about what to do in Fez. Dar Bensouda, (from €66)  No.14 Zkak El Bghel, Quettanine, Tel: 05-35638949. Lovely riad transformed from a traditional palace with two courtyards and a swimming pool. Friendly and helpful English-speaking staff. Dar Othmane, (from €25 p.P. in a Double)  No.76 Farrane Couicha, Chrabliyine, Tel: 06-71014710. Lovely family run guesthouse in the heart of the medina, beautiful courtyard, roof terasse for relaxed evenings, 4 lovely en Suite rooms (Single, Double, Triple),the souk is around the corner, Bab Boujiloud about 10 minutes walk. Friendly and helpful English-speaking staff. Dar-Lek: this house is for exclusive use (there will be no other guests) for up to 6 people. It is in the ancient Medina and has been beautifully restored; it comprises 2 en-suite bedrooms, a salon with kitchenette (so you can prepare your own snacks), terrace and hammam. Typical prices are from 30Euro per night for 2 people although amazing deals can be had off season. Massage and other beauty treatments can be arranged for a small additional fee. Book via booking page on website. There are a growing number of beautiful, comfortable guest-houses ("riads") in the medina of Fes el-Bali. They are expensive by Moroccan standards but offer luxury for about the price of a North American chain hotel. Some Moroccan proprietors prey on Westerners' culture-shock to direct business toward favored or overpriced services, so it is worth doing your research before going. Fez is safe, but crowded. Take standard precautions regarding wallet, purse, etc. If you hear "Belek! Belek!" behind you, stand aside because a heavily-laden donkey is bearing down on you! Appear to know where you are going, even if you don't, or you will get offers from false guides. False guides are not dangerous but they can be exasperatingly tenacious. They can also promise to take you to your hostel or hotel... walking a much longer way, so you can expect being cheated. Best technique is to not even acknowledge their presence. That is rude and they won't be pleased, but it is better than to have them walk with you for half an hour. If you have to ask directions ask to someone that is obviously busy in his own business and try to appear as sure as you can of the way you are going ("This way to R'cif, right?"). Getting caught with a faux guide will cost you, but it will cost the faux guide more: they can receive up to 2 days imprisonment if they get caught. Cops are often in plain clothes, so be wary! A useful strategy with false guides is to say all the lines they have been taught before they have said them to show you know what you are doing; they all say the same thing so just learn it and repeat. Just a tip for any situations: keep in your wallet only fews dhirams most part in coins, divide remaining money in different places so if a faux-guide, an insistent seller or just to negotiate price you can stay safe and show an empty wallet. You should also beware of hustlers (aka con-artists); Fez has a far larger number of them than almost everywhere else and they use more sophisticated techniques. An example of a prominent scam occurs where you come into Fez by train and someone talks to you saying he is coming to visit his relatives, and is actually a respectable outsider (e.g. an owner of a hotel). He will then ask you to come eat with his relatives and when you get there they will spend most of the time trying to suggest accommodation, offering you tours where they gain commission from all the (especially Carpet) shops, and even organize expensive desert excursions that are actually just you driving in circles just outside the city for three days. Beware of people at the train/bus station (even the bus driver) who introduce you to their "cousins" or "brothers," trying to involve you in some sort of carpet-selling scam, and especially refrain from handing over your credit card in such situations. There are many other scams and annoyances trying to get you into a shop/restaurant/hotel with various degrees of lying in the stories people make up. If in doubt, be independent and look for yourself e.g. whether the hotel you want to go to is indeed closed or under construction. This is unfortunately one of the sad things about Morocco, that you get to distrust every one, even those people who are genuinely friendly and hospitable, because sometimes this is only a facade. Fez requires a real change of outlook or it will might be a very high-stress trip! Shopkeepers and guides are very assertive and you will have to get used to saying "no" a lot. On the other hand, they can be genuinely warm and friendly even while trying to sell you something, an idea that is pretty alien to North Americans where it is assumed that a business relationship is the opposite of sincerity! Non-Muslims are not allowed to visit mosques, although they can visit the medersas (religious schools). Bargaining is a way of life that has survived for centuries, and shows no sign of changing. Moroccans even bargain among each other for everything except perhaps their utilities. Don't believe anyone (and you will hear it all the time) who tells you prices are being "regulated". Every other souk claims to be a "Government Regulated Co-op". There is a single, genuine government-regulated fixed price shop in the Ville Nouvelle where all prices are posted, the goods are of decent (if not amazing) quality, and the single bored cashier will just stare incredulously at you if you attempt to bargain with him. Ask any hotel manager or petit taxi driver to take you to the "Artisana." All products sold in Artisanas come directly from the artists who made the products. The ancient Roman site of Volubilis. A visit to the ancient Roman site of Volubilis is a must. This crumbling yet spectacular city has stunning mosaics on offer, and you can easily spend a couple of hours ambling through the ruins. There are organised coach tours running from Fes, however the more intrepid budget traveller can make this journey on their own by catching the train from Fes to Meknes and then a couple of 'collective' taxis to the picturesque historic town of Moulay Idriss then on from there to Volubilis. This is approx a 1/4 of the price of the organised tours and provides far more opportunity for adventure. Alternatively, Meknes itself is worth a visit, if only due to its calmer and less crowded medina, which has ample shopping opportunities. From the Gare Routière, you can leave By bus for almost any direction in North Morocco. Buses are sometimes older and not as new as CTM, but some operators like Nejme Chamal provide modern clean and safe buses to most destinations. CTM offers European-quality service, for a double price then the Moroccan standard, but usually including the 5-10Dh required for transporting luggage (malletas), and not being overcrowded. People use to come to the station in the morning to book their ticket for the afternoon or the day after, and collecting stickers for luggage, so beware about showing up at the last minute and not finding place. A typical bus from Fes to Tangier will cost about 70DH. CTM leave for the main destinations (Marrakesh, Rabat, Tangier, Tetouan, Oujda, Nador). Going from Fez to Rissani (Merzouga is another 30km taxi ride after Rissani) there is one CTM bus a day, leaving the Fez bus station at 9PM. Other companies serve any town and village in north and center Morocco; departing hours are shown over the counters, but may change from one day to another, so be sure to ask to the employee. Supratours also runs a direct bus from Fes to Merzouga, stopping in most of the major towns along the way including Rissani and Errachidia. Supratours has their bus parked almost directly opposite the Fes trainstation (Gare de Fes). Just walk outside up the the roundabout and look across the street, their office is right there. You can buy a one way ticket from Fes to Merzouga for 190DH, bus departs at 1930hrs and arrives in Merzouga around 0530hrs. Supratours bus departs Merzouga back to Fes at 1900hrs. This page was last edited on 25 March 2019, at 14:04.